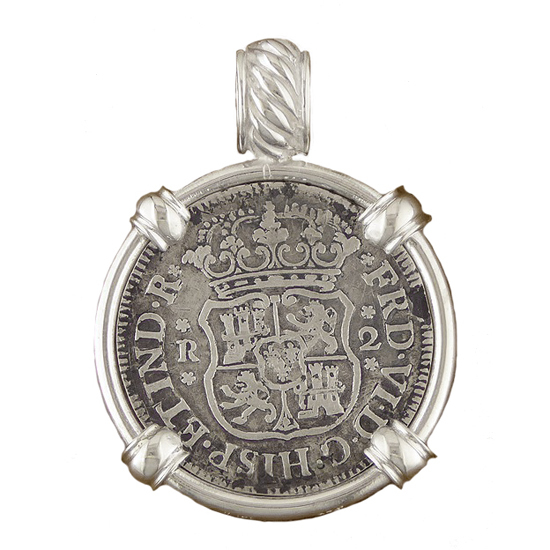 Spanish Silver Colonial Coin Pendant - 2 Reales. Coin Type: SPANISH PILLAR. Date: 1756. Denomination: TWO REALES. Assayer: M Ruler: FERDINAND VI, Metal: SILVER Mint: MEXICO CITY, MEXICO. 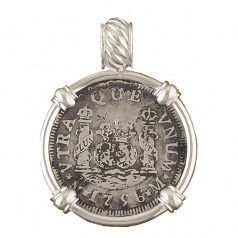 Framing: STERLING SILVER Obverse: FRD.VI.D.G.HISP.ET.IND.R. around crowned shield of the House of Bourbon, value to the left and right. 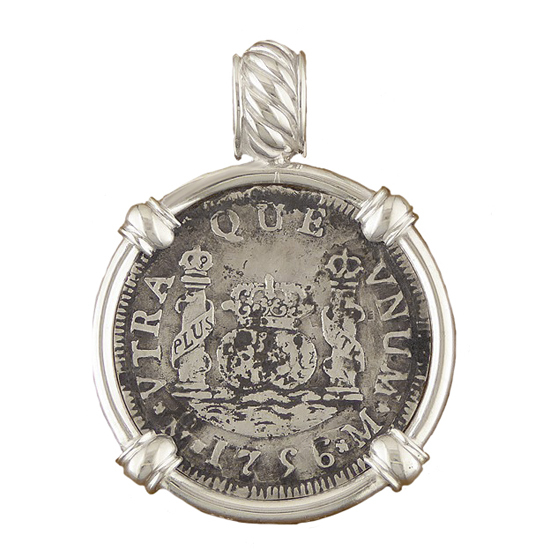 Reverse: Mo (mintmark) VTRA QUE VNUM M (assayer) around crowned globes by the Pillars of Hercules, date below. The second son of Philip V and his first wife, Maria Luisa, Ferdinand was married to Barbara of Portugal to whom he was devoted. She shared his love of music and opera. Ferdinand has won greater praise from foreign historians than from his own countrymen. He was a repository of most of the duller virtues such as honesty, honor, thrift, and fidelity to his beloved Barbara. As a result, he failed to inspire the imagination of his people. Ferdinand's policy of "peace to all men" was unlikely to appeal to a nation to which "conquistador” was still a much respected word. This deficit of spirit may possibly be linked to impotence from which he is said to have suffered. Whatever its origin, Spain was the beneficiary as the country. Its people were materially better off at the end of his 13 years on the throne than half a century of Carlos I or 42 years of Philip II. Upon his accession at 33 years of age, Ferdinand's first action was to remove his stepmother from court. His second action was to surround himself with a competent, cosmopolitan group of advisers drawn from a cross section of the community. He relied considerably on his father's minister, Marques de la Ensaneda to oversee the administrative and financial matters of state. Attached to a policy of peace, Ferdinand directed his attention to internal reforms and curbed the excesses of the Inquisition, (the tribunal for suppressing heresy and heretics). Additionally, he was a patron of the arts and learning, founding the Academy of San Fernando for fine Arts in 1752. After the death of Barbara in August 1758, Ferdinand suffered from melancholy bordering on madness. It is said he would shut himself in his room and prowl around like a caged animal or sat motionless for hours on end. He refused to bathe or change clothes, alternating between gorging and starvation, amid attempts to hang himself. His death in August of the following year was a merciful release, and the crown passed to his half brother Carlos III.